Constructional difficulty: 1U version - moderate. 3U version - complex. This is the 1U wide 'Filter Core' version of the Diode SuperLadder. 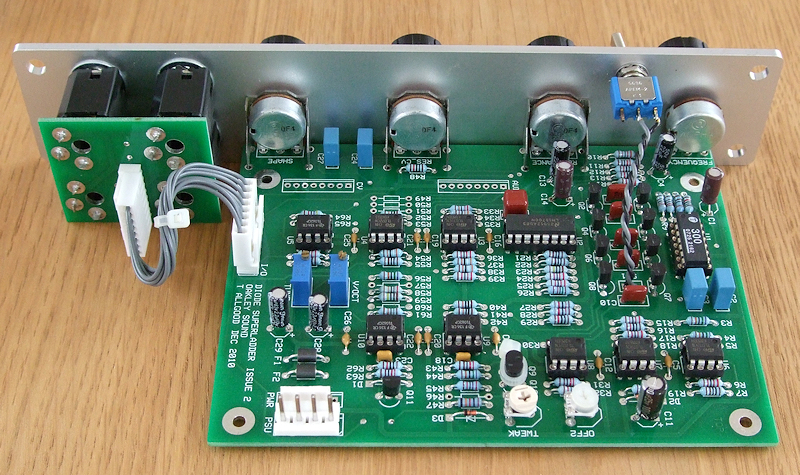 One would normally use this module in conjunction with external mixers for maximum control. This latest version of the classic Oakley Superladder has been re-designed from the ground up to sound good using diodes. The circuit is considerably different from all previous designs and has its own tonal characteristics I think you will love. It now features a new switch to select the maximum number of diode rungs in the ladder. You can now chose between four and five pole filtering - with the five pole mode giving a steeper roll off and smoother tone. 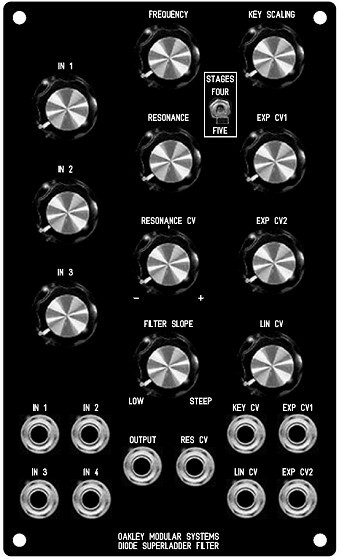 The Diode Superladder VCF features both voltage control over frequency and resonance. Unique to any diode ladder filter is has a variable shape output. This incorporates a feature first seen on the Oakley Orbital prototypes. A single pot allows you to vary the output from one (or two) pole low pass to four (or five) pole low pass via band pass in the middle. The Diode Superladder's output is what we call 'Q compensated'. This means that the output volume will not drop significantly when you turn up the resonance pot. This design uses two inbuilt VCAs to achieve voltage controlled resonance without the hassle. At high levels of resonance the Diode Superladder will self-oscillate across most of the audio band and thus can be used as a sinewave voltage controlled oscillator. The filter core uses transistors wired as diodes which means it does not clip the signal abruptly but saturates smoothly. This allows the Diode Superladder to sound very different depending on the input signal level. When used with signals below 2V peak the Superladder will sound clean and bright. However, take your signal levels above 2V peak and it will start to take on a more strident tone particularly at higher levels of resonance. Coupled with the variable slope control, this sensitivity to input level means the Diode Superladder can produce a wonderful array of different tones. For the classic transistor ladder sound please have a look at the Oakley Transistor Superladder. The voltage controlled filter, or VCF, may be built as a 1U filter core or as a complete 3U filter system. The 1U 'Filter Core' format is our way of handling filter modules. Although the 1U module can be used as a filter module on its own, it is expected that users will make use of external mixers to control CV and audio levels going into the filter. In this way, you will be able to have a collection of space saving 1U filter cores that can be used with any generic mixer module. The Oakley Multimix is an ideal choice for a handy mixer module. The PCB is 10.6cm (deep) x 14.3cm (height). The frequency, resonance, resonance CV depth and shape pots are normally board mounted for easier construction. As with all Oakley projects the PCB is double sided with through plated holes, has solder mask both sides, and has component legending for ease of construction. This is the suggested panel design for the 3U version of the Diode Superladder. This is a fully featured filter module that includes inbuilt CV and audio mixer sections. Slow sequence in four stage mode. Cut off frequency, filter slope and resonance are manually tweaked. Faster sequence in five stage mode. Again cut off frequency, filter slope and resonance are manually tweaked. Another sequence, this time more of a Berlin School thing, with added effects for ambience. The Diode Superladder as a single width MOTM format module in a natural finish Schaeffer panel. In this particular unit I have chosen not to bring the 'four/five stage' switch out to the front. Instead the final number of stages is simply selected by a removable jumper. Note also the use of the optional Sock4 socket board to help keep the wiring to the sockets neat and tidy. Diode Superladder ready made modules in MU format are available from Krisp1.com.